TE7 cells (2 × 105) were pretreated with PD98059 (20 μM), QNZ (EVP4593; 20 μM), AZD5363 (20 μM), S1155 (20 μM) and Tra (40 ng/ml) for 1 h and stimulated with IL6 (40 ng/ml) for 48 h.
A. Raw264.7 cells were pretreated with NAC (1 mM), SB202190 (10 μM) and Sodium 4-aminosalicylate (10 μM), respectively, for 30 min prior to 10 μg/ml ConA treatment for 24 h. Cell viability was measured by an MTT assay and ROS production detected by H2DCF-DA. CD10+GPR77+ CAFs were transduced without (-) or with GFP-shRNA or p65 shRNA or pretreated with inhibitors of NF-kB nuclear translocation. Quantitation of the percentage of CD10+GPR77+ CAFs (D) and the IL-6 and IL-8 levels (E) were shown. The protein expression alteration of p-NF-κB, NF-κB, PD-L1 in NP-69-LMP1 or NP-69 cell lines treated with 0, 0.5, and 1.0 μM Caffeic Acid Phenethyl Ester (CAPE) for 72 hours. β-actin was used to verify equal loading. Eleutheroside E, a principal component of Eleutherococcus senticosus (ES), has anti-inflammatory effects by inhibiting NF-κB and protecting against myocardial infarction. Evodiamine ameliorates PDGF‑BB‑induced oxidative stress in VSMCs. VSMCs were pretreated with 0.1 or 0.5 μM evodiamine for 24 h, and then stimulated with 10 ng/ml PDGF‑BB for 1 h. (A) ROS detection using 2' 7' dichlorofluorescin diacetate staining. Magnification, x200. (B) Quantitative data of five independent experiments, expressed as the fold increase, compared with the control. (C‑F) mRNA expression levels of antioxidant genes were assessed using reverse transcription‑quantitative polymerase chain reaction analysis. Data are presented as the mean+ standard deviation of three independent experiments. *P<0.05 and **P<0.01, compared with the control group; ##P<0.01, compared with the PDGF‑BB‑stimulated group. Evo, evodiamine; PDGF‑BB, platelet‑derived growth factor‑BB; VSMCs, vascular smooth muscle cells; ROS, reactive oxygen species; HO‑1, heme oxygenase‑1; GPx‑1, glutathione peroxidase 1; SOD, superoxide dismutase. Immunofluorescence of NF-κB (p65) (200×). SK-OV-3 and A2780S cells were treated with different compounds (vehicle, 5 μM JSH-23, 5 μM SC75741, 5 μM CAPE, 4 μM MIL, 4 μM MIL combined with pre-treated 5 μM JSH-23, 4 μM MIL combined with pre-treated 5 μM SC75741, 4 μM MIL combined with pre-treated 5 μM CAPE) for 48 h. NF-κB(p65) was detected by a fluorescence microscopy. The nuclei were stained with Hoechst 33258. Magnolol reduces RNV areas and avascular areas in OIR mice. Mice retinas from OIR group (a, b) and OIR + Magnolol (25 mg/kg) group (c, d) were harvested at P17 and subjected to wholemount immunostaining with IB4 (red), showing neovascular areas (green) and avascular areas (yellow). Curcumenol, a sesquiterpene isolated from Curcuma zedoaria, is known to possess a variety of health and medicinal values which includes neuroprotection, anti-inflammatory, anti-tumor and hepatoprotective activities. 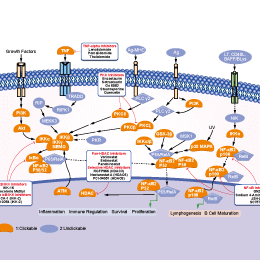 It inhibits NF-κB activation by suppressing the nuclear translocation of the NF-κB p65 subunit and blocking IκBα phosphorylation and degradation. Treatment with triptolide selectively induces apoptosis of cultured and primary CD19+ CLL cells. A. Percent apoptosis (Annexin V-FITC and PI staining) in Mec-1, Mec-2 and WAC3-CD5+ cells exposed to the indicated doses of triptolide for 48 hrs; bars indicate standard deviation. B. Percent apoptosis of CD19+ normal and primary CLL (both high and low risk) cells exposed to the indicated doses of triptolide for 48 hrs; bars indicate standard deviation. C. Percent of WaC3-CD5+ and Mec-1 cells in different phases of the cell cycle (G0/G1, S and G2/M) exposed to the indicated doses of triptolide for 24 hrs. D. Immunoblot analyses of HSF1, HSP70, cleaved caspase-3 and β-actin obtained from the cell lysates of CD19+ primary CLL cell samples treated with the indicated doses of triptolide for 24 hrs. Cardamonin is a naturally occurring chalcone with strong anti-inflammatory activity. It is a novel TRPA1 antagonist with IC50 of 454 nM and also a NF-kB inhibitor.